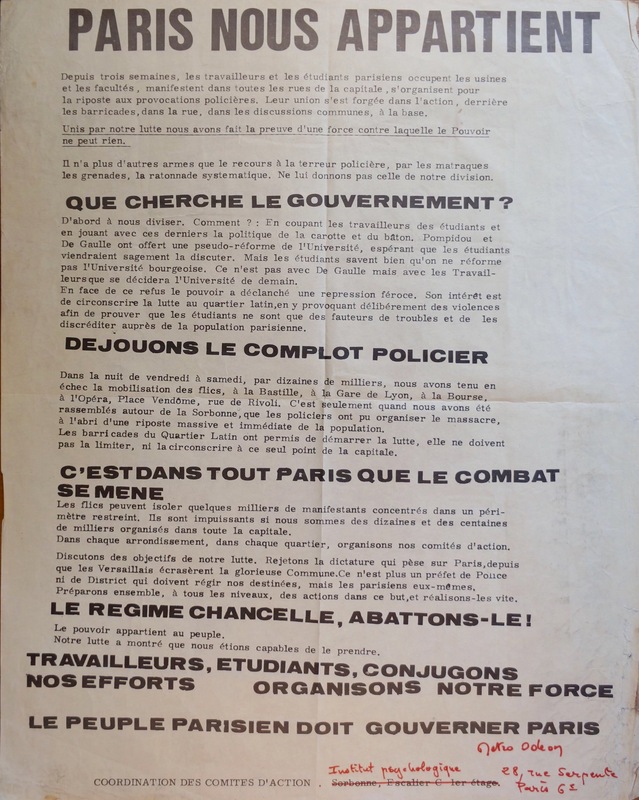 For three weeks the workers and students of Paris have occupied the factories and faculties, protested on every street of the capital, and organised themselves in response to police provocation. Their unity is forged in action, behind the barricades, in the streets, in communal debate, from the roots. United in our struggle we have proved ourselves to be a force that the State can do nothing to oppose. It has no more weapons to resort to other than police terrorism, with batons, tear-gas grenades and systematic beatings. Let’s not let it divide us. WHAT IS THE GOVERNMENT SEEKING? Firstly, to divide us. How? By cutting off the workers from students and playing the politics of the carrot and stick. Pompidou and De Gaulle have offered a pseudo-reform of the University, hoping that the students would obediently come to the table. But the students know that the bourgeoisie University wont be reformed. It’s with the Workers and not De Gaulle that future of the University will be decided. Faced with this rebuttal the state has unleashed savage repression. Its goal is to confine the struggle to the Latin Quarter, and deliberately provoke violence there, in order to show that the students as mere troublemakers, and to discredit them in the eyes of the people of Paris. On Friday and Saturday night, by the tens of thousands, we kept the mobilisation of the cops in check at the Bastille, the Gare de Lyon, the Bourse, Opera, Place Vendome, and rue de Rivoli. It was only when we had assembled around the Sorbonne that the police were able to organise the slaughter, safe from an immediate and massive retaliation by the population. The barricades of the Latin Quarter allowed the fight to begin, but they mustn’t delimit it, or confine it to this one part of the capital. The cops can isolate a couple of thousand protestors who are gathered in a restricted area. They are powerless if we are tens or hundreds of thousands organised throughout the capital. Let’s set up Action Committees in every arrondissement, and in every district. Let’s discuss the aims of our struggle. Let’s reject the dictatorship that has oppressed Paris ever since the government of Versailles crushed the glorious Commune. No Chief of Police or Mayor can determine our destinies any longer, but rather Parisians themselves. Together, at every level, let’s prepare action towards this goal, and let’s undertake it quickly. THE REGIME IS TOTTERING, LET’S KNOCK IT DOWN! Our struggle has shown that we are able to seize it.